STUDENT DIVERSITY: Students come from 44 states and 57 countries. Approximately 40% of our student body are students of color. FACULTY: 600+ full-time faculty members; 14:1 student-faculty ratio; 93% of faculty hold the highest academic degree in their field. INTERNSHIPS:525+ employers have hired Loyola students for academic internships. 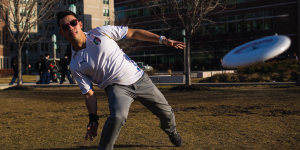 STUDY ABROAD:More than 30% of students study abroad. INTERNATIONAL STUDENT SERVICES:The Office for International Programs (OIP) coordinates study abroad opportunities for Loyola students and offers services to visiting international students and scholars. The OIP also operates the Chicago office for the John Felice Rome Center and the Beijing Center and provides ESL services to the Loyola community. • Graduate: Tuition and fees vary depending on the program. * Annual estimate; includes full-time tuition, room and board, and fees. Visit luc.edu/bursar for more information. FINANCIAL AID: 99% of our students receive financial assistance, with 91% being awarded grants and/or scholarships. Merit-based scholarships are available for freshmen and transfers, including international students. Visit luc.edu/finaid for more information. 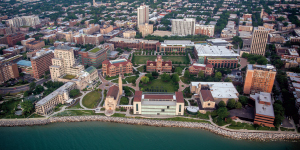 Shaped by its vibrant urbansetting and Jesuit tradition, Loyola University Chicago offers a transformative educational environment. We empower students to develop knowledge and skills, find their purpose, shape their identity, and make a difference in their community. At Loyola, we offer the tools students need to achieve success in the classroom, their career, faith, life, and the world. We represent and welcome all faiths, ethnicities, and economic backgrounds, with a common purpose of building a better society. 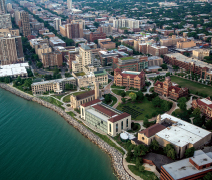 Loyola is located in Chicago, Illinois,the third-largest city in the UnitedStates and a global leader in commerce,industry, and culture. Chicago is an extended campus for Loyola students, who have direct access to the city’s countless career, internship, service, cultural, recreational, and entertainment opportunities. You will take classes primarily at the Lake Shore Campus, nestled along Lake Michigan on Chicago’s NorthSide, and at the Water Tower Campus, located in the city’s famous Gold Coast neighborhood. Medical students benefit from the University’s clinical partnership with the Loyola University Health System and Trinity Health. Our Health Sciences Campus, located in suburban Maywood, is home to Loyola’s Stritch School of Medicine, Marcella Niehoff School of Nursing, and the Graduate School’s Biomedical programs. Loyola’s reach extends around the world. The John Felice Rome Centerin Italy and the Vietnam Center in Ho Chi Minh City, along with more than150 other study abroad options in 70countries, offer students the chance to engage with the global community and economy. Loyola offers more than 80 majors and minors within our 11 schools, colleges, and institutes: Quinlan School of Business, Marcella Niehoff School of Nursing, School of Communication, College of Arts and Sciences, School of Education, School of Social Work, Stritch School of Medicine, School of Law, School of Continuing and Professional Studies, and our Graduate School. In addition to our majors and minors, Loyola offers more than 30 five-year programs where students can complete a bachelor’s and master’s in a condensed time frame. Course work is integrated from multiple disciplines to give you an opportunity to explore and synthesize topics from a variety of viewpoints. Our distinguished faculty are leaders in their fields. They integrate research and practical experiences into the classroom. At Loyola, some of the most impactful learning takes place outside the classroom. Students routinely give back to the community while exploring their interests and may earn academic credit for their service. Loyola offers more than 250 student clubs, activities, and organizations to connect with others, make lifelong friendships, and enjoy a rich college experience. Loyola competes in 13 NCAA Division I sports. SDMA at Loyola advances the recognition and appreciation of our diverse community, promotes multicultural education across campus, strives to ensure success of underrepresented students, and fosters a supportive, inclusive environment for all students, faculty, and staff. SDMA engages in community-building and student success through programs and initiatives that provide transformative opportunities to students. The following programs are offered through SDMA and help connect students to faculty and staff. Brothers for Excellence: Studentmen of color are mentored by facultyand staff of color with the objective to help students achieve success in all areas of life and be active leaders in the Loyola community. Students Together Are Reaching Success (STARS): First-generation students and students of color are connected with upperclass students for individual and group mentoring. Mentors provide mentees with guidance and advice throughout their first year of college and assist with their overall transition to campus life. The STARS program was first established in 1986 and has continued to provide academic, social, and personal support to new Loyola students. Seizing Opportunities for Academic Resilience (SOAR): New students of color and first-generation students attend a four-day/three-night experience at Loyola where they connect with current students and faculty, building meaningful relationships in a fun, interactive environment. Loyola University Chicago Empowering Sisterhood (LUCES): This is an opportunity for students, faculty, and staff women of color to engage in programming and community-building on campus. People’s Institute: The People’s Institute Retreat is an experience designed to explore and reflect on the interconnection between leadership and social justice. These are just a few ways that SDMA is empowering our students, faculty, and staff to be engaged in our community and successful in their lives—personally, academically, andprofessionally.